Whenever I style for shoots, I always make sure I’m in something comfortable and easy to move around in. No low cut tops, heels and tiny skirts. Shorts and flats are definitely preferred! Whenever possible, I usually wear foldable flats. I prefer them over regular ones because I can easily change into my heels if I have an event or somewhere else to go to after my styling job. It isn’t easy finding nice foldable flats though so I make it a point to share with you brands that offer these kind of flats whenever I discover them. The pair I’m wearing here is from British brand Cocorose London. In my opinion, they’re probably one of the more well-crafted foldable flats I’ve tried. Their soles in particular are not as thin as other brands’ soles. My feet actually feel protected in these! I think it’s mainly due to the material they use. This pair I’m wearing is actually made of soft, sheep leather and fish skin with double cushioned insoles, a non-slip outer sole and petite heel. Nice, right? You can really see the difference. Plus, it doesn’t hurt that they look cute as well! I really hate it when design is sacrificed for practicality and function. Thankfully, Cocorose London offers both design and comfort. For more of Cocorose London‘s lovely foldable ballerina flats, visit www.cocorose.ph. You can also find Cocorose London at Rustan’s Shangri-la Mall, Rustan’s Alabang Town Center, The Flatshop and Tarte Tati. I love how you can combine necklaces and make them look like one piece! I love this look! I am so happy that I discovered your blog last year. I was even your follower on Tumblr! You transferred to WordPress na pala. More giveaways promise! :) Thanks pat! Haha boys don’t get it! Thanks Nicole! PS: I’m a fan of flat shoes but my mom keep on telling me to wear high heels because I’m not that tall like you hahha. But what’s wrong with wearing a comfortable shoes right? I just hope mom knows that hahhaa. PS no 2: Hahaha. Because of you I’m using “PS” again. Hahaha! Very pretty and sweet outfit! wow i love your shorts! is that available in sm makati too or just mall of asia? and does it have other colors too? i would really want to buy those shorts! Love it! Another perfect pairing. I super Love all everything your outfit, accessories, shoes , bag, Kaya I always check your blog plus plus.. Love the hair color <3 I want ! What is hair colour type..? Thank you Lyn! :) Go for it! Your just perfect, you’ve styled another amazing and perfect outfit! It features Kiefer Ravena and Von Pessumal, current basketball players for the Blue Eagles!!! A tweet about it would be amazing as well! 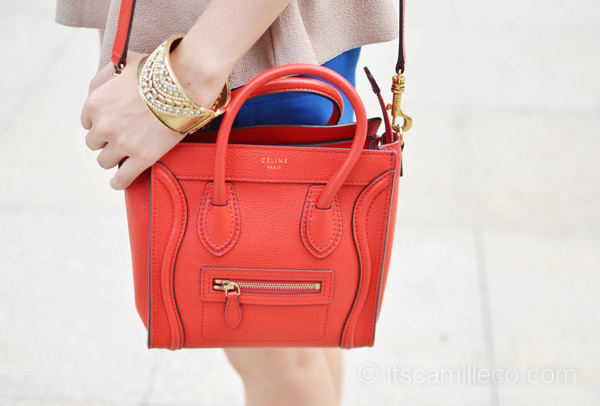 PS I love love love your Céline!! Thanks Cara! This is such a funny video! Haha! Ganda ng hair at makeup mo! Mas lalo kang gumanda! Walang echos. Awww thanks Mars! Makeup artist kasi ang gumawa! I wish I have a makeup artist every day haha! It must be there! I’ve been super busy lang talaga so tons of emails have piled up. :) I’ll try to reply soon! Awww so cute! Thanks Dana! I’m sure your parents were thinking who the heck is this kid haha! More or less complimenting you and asking if you’re from the Philippines. shoddy Japanese is shoddy ^^; Sensei can kill me for not practising. hi camille :) so happy to visit ur blog again(ritual ko na tlaga to.. TRUE! hehe)… cud u pls giv me sum fashion advice on how to be pretty and fierce just like you on our up & coming Graduation pictorial.. thank so much! Another stunning look! Love the peplum top layered over your blue shorts….and that necklace is incredible!! Wow! Those flats look fab & comfortable. That is rare. Also loving all the colors in this look. I’m speechless Camille…I’m amazed on how you make your everyday living an everyday lookbook funshoot. P.S i love the tone of the photos, the outfit, the smile, and almost everything. I think your photographer should also get a credit. So gorgeous!!!! I’m such a fan!! Hope you’ll come to Cebu!! So beautiful.hope that you’ll come here in Cebu! And I would love to meet you!! Or even take a pic of you! that will be an unforgettable experience!! :))) *fingers crossed and hoping!!! :) I’m such a fan!! Haha!!! I’d love to go back again! :) See you then! I love everything.. especially the necklace and belt! You look stunning! These weren’t :) Usually I remove my rings or when I’m wearing noisy bangles which I’m not haha :) The lace detail would’ve been nice too! Peplum can do that! Thank you Jeline! I saw a picture of you with black hair in Tricia’s blog for the first time, you look sooo Chinese. Haha With your current hair color though, you look Korean. Whatever your hair color is, you still look beautiful,. Congrats with your preview mag cover! Amazing outfit! Love the accessories! Girl go for it! I know girls who are as tall as you and they still rock stilettos! :) Love your height! LOVE all the gold tones in your accessories! CUTE! “A fine head of hair is the pride and joy of every woman’s heart. ” As always, you’re too pretty for this world. :) I love everything in this post!! Was checking Kryz’s post earlier. Royal blue shorts – red shoulder bag is your theme today. Cute! and both are looking so so good..
Awww I miss her! Thanks Palm! love the bag super gorgeous !! 5’7″ :) Thank you Danelle! It’s all about camera angling haha! such a gorgeous look! love the bag! Interesting these foldable flats.. They actually look like they have soles. Not like the folding soles I’ve seen in some shops, which look a little more than just thick socks. You look so comfy, your hair in these photos show it. LOOOOVE. You look 6 yrs. younger here! ;) your hair is so long na! Don’t you have plans of changing its color and be brunette again? I’d still prefer this hair though. You don’t want to go blonde? Like Emma Stone as Gwen Stacy kind of blonde? Thanks Tasha! :) I still love this color though. I don’t think I have the guts to go blonde. I want to but I don’t think I’ll be brave enough to handle the stares haha!